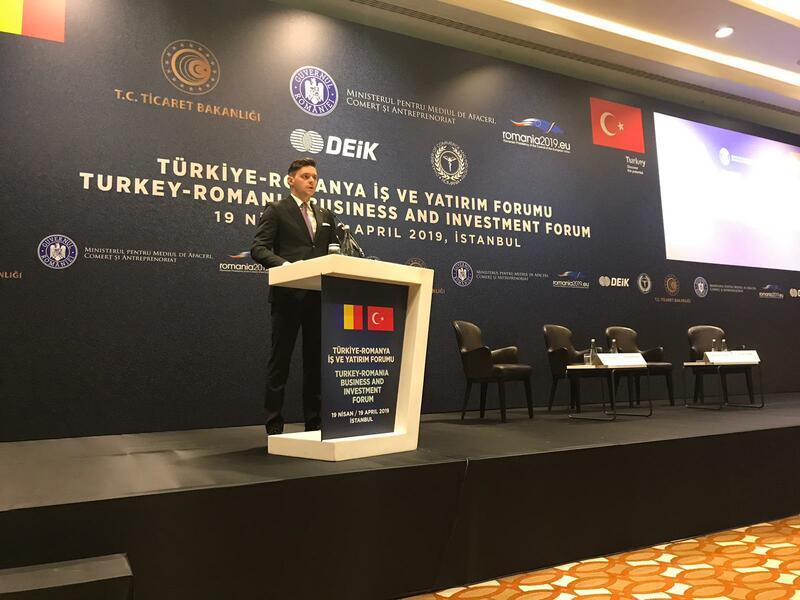 The Chamber of Commerce and Industry of Romania is one of the most important forums for representing Romanian businessmen for the last 150 years. As a component of the free market economy, the Chamber of Commerce and Industry of Romania tended to the development of the business environment and also, of Romania. The history of the Chamber of Commerce and Industry of Romania is connected with the process of modernization of the Romanian Principalities from the 19th Century and the establishment of the first Chamber of Commerce in our country represented a reference point for the Spring of Nations generation. During the 1848 revolution, Ştefan Golescu, a young man who came from the Walachian bourgeoisie, educated in Switzerland together with his brothers, made a name for himself. After he was exiled because he was part of the delegation that negotiated with the Ottoman Empire the adoption of The Declaration from Islaz, Golescu returned to our country in 1857 and he was one of those who elected Alexandru Ioan Cuza to be the leader of Walachia two years later. Ştefan Golescu becomes the Minister of Finance in the Government ruled by Ion Ghica, and one of his projects is the establishment of the Chambers of Commerce. Golescu’s project, supported by the merchant’s guilds and corporations, doesn’t get the support from the Legislative Assembly from Bucharest and Iaşi. Three years later, in 1863, the Minister of Agriculture, C.A. Rosetti, sends to the Legislative Assemblies a new initiative for the establishment of the Chamber of Commerce in the United Principalities. On 30 September 1864, Prince Alexandru Ioan Cuza signs the Royal Decree 1363 regarding the establishment of the Chambers of Commerce and Industry. The project was looking to consolidate and improve the new Romanian State, by creating institutions which were meant to connect the Romanian Principalities to the western capitalist economical system, which became the political, economical and cultural model for Romania during the second half of 19th Century. According to the Royal Decree, adopted in 1864, there were 15 Chambers of Commerce which were established within the United Principalities: Bucharest, Turnu–Severin, Craiova, Turnu–Măgurele, Giurgiu, Brăila, Galaţi, Ismail, Bârlad, Iaşi, Piatra – Neamţ, Bacău, Focşani, Botoşani şi Ploieşti. The first Chamber of Commerce which starts its activity is the one in Bucharest, in 1868. In this time, the merchants, represented by the Chamber of Commerce, started to intercede with the State Authorities. For example, they asked the Ministry of Justice to initiate the procedure of registration of all the merchants and that’s how the first Register of Commerce was created. The Chamber of Commerce actively participated in the development of the economic framework of the Capital and it contributed to the key moments in the development of the business environment, such as creating the customs offices, the regulation of Synday rest, the first law of trademarks or the law of encouraging the national industry (which offered the advantage of 5% of the price for the Romanian industrial products during the auctions against foreign products). Therefore the groundwork for the functioning of Chamber of Commerce have been laid, with the main role being to represent and consult the merchant’s interest in front of the State Authorities, in fiscal and economic fields. One of the problems that the representatives of that time had to deal with was the subordination of the Chamber of Commerce to the Prefect, because they thought that the economical freedom wasn’t respected this way. After almost two decades of trying to change the Law of the Chambers of Commerce, the merchants managed to obtain a new law, Royal Decree 1551 in 1886, signed by the King Carol I. The second law of the Chambers of Commerce stipulated the elimination of Government authority over the Chambers but also the reduction of the numbers of the Chambers from 15 to 10. This law held good for almost 40 years, when it was modified by the Parliament of the Greater Romania, in order to correspond with the realities of the new Romanian State. 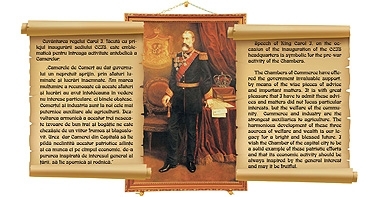 Through the Royal Decree 102 from 1925, King Ferdinand adopted the third law of the Chambers of Commerce, which reformed the Romanian Chamber System. The new law expanded the number of Chambers of Commerce and their competences and it also stipulated the establishment of a national organization, which had to represent all the territorial Chambers, called The Union of the Chambers of Commerce and Industry. Up until 1938, the Chambers have functioned as autonomous public institutions, with a governmental commissioner assigned for each Chamber; afterwards they have been put under the authority of the Ministry of National Economy. In the Romanian Kingdom, the activity of the Chambers of Commerce bacame more and more important and correlated with the economic realities of the time. 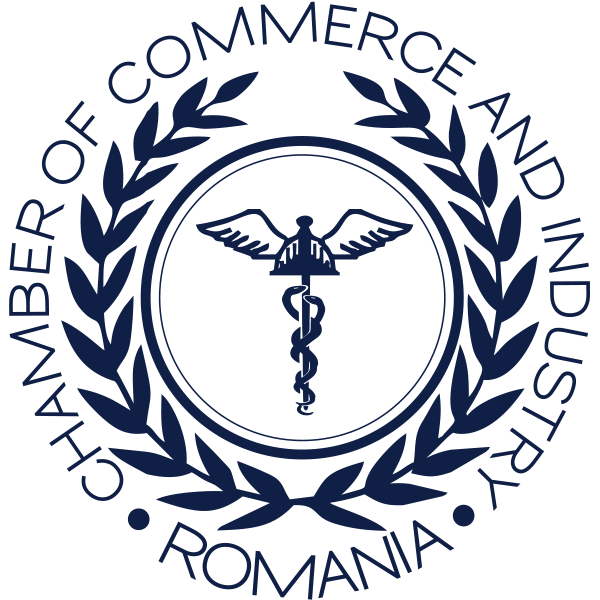 The Romanian Chambers of Commerce have left their mark on the first commercial and industrial schools; have developed international relations with similar institutions from other states, have contributed to the liberalization of commerce, the modernization of transportation and communication, and to the expansion and consolidation of the internal market. The Romanian Chambers of Commerce and Industry have been disbanded, in 1949, through decree no. 75 of the Presidium of the Great National Assembly of the Romanian People’s Republic and the Bucharest Chamber of Commerce and Industry was placed under the strict control of the communist regime, reorganized as the Foreign Trade Chamber of the Romanian People’s Republic. In 1971, the institution became the Chamber of Commerce and Industry of the Socialist Republic of Romania. After the 1989 Revolution, the Romanian Government has adopted the Law Decree no. 139/1990 regarding the Chambers of Commerce and Industry, moment that marks the rebirth of the Chamber System. The new Chambers of Commerce have been granted the status of non governmental organizations, associative to the business environment; they became the main pillars of the market economy, dominated by private entrepreneurs. In the same time with the reestablishment of the Chambers of Commerce and Industry, the Trade Register system was set up. In this period, the Chamber of Commerce and Industry of Romania and the whole Chamber System have worked for the reconstruction of the Romanian market economy for the perspective of the accession to the European Union and to the Euro Atlantic structures. CCIR developed the activity of the Trade Register, outlined the vocational training and laid the ground work for a modern expositional company, known today at national and international level – Romexpo SA. Today the Romanian Chamber System is regulated by Law no. 335/2007 regarding the Chambers Commerce in Romania, supplemented by Law no. 39/2001. The current organization is similar with the system in place from 1925 when there was a Chamber of Commerce in every county seat and they were grouped under the Chamber of Commerce and Industry of Romania. Therefore the Chamber System in Romania represents the associative network of the business environment with the broadest representation at national level and is the only organization present in every county of the country.